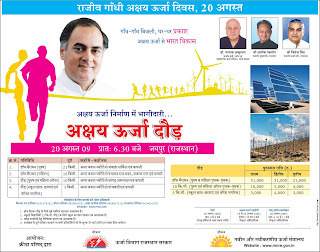 Ministry of New and Renewable Energy, GoI, Energy Department, Govt of Rajasthan and Sports Council of Rajasthan will be organising a Half Marathon and other Races on the occasion of Akshay Urja Diwas on the birth Anniversary of Late PM of India Mr Rajiv Gandhi. The race will be conducted in Jaipur for different groups and prior registration make you eligible for T-Shirt and Cup for the occasion beside you can won prizes and help in creating awareness about the renewable energy. So, Why waiting for .. Go, get yourself enrolled. For details Click on the aboveimage. See you there.